Sopa de Torrejas, also known Sopa de Masitas, is a traditional soup from the region of El Cauca in Colombia. 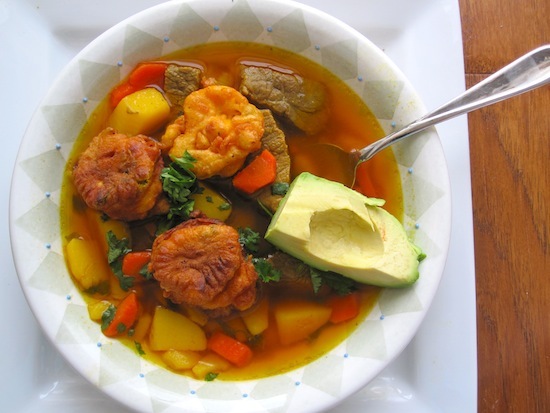 This soup is made with beef, onion, garlic, cumin, achiote, potatoes, carrots, flour fritters and cilantro. 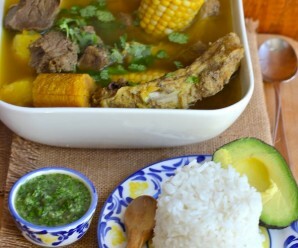 It is served with avocado, rice and hot sauce or ají. It is the kind of Sunday meal served with a side of plain white rice and avocado that I absolutely love. It’s simple, comforting, satisfying and delicious. Place a pot over medium-high heat. Add the beef, beef stock, carrots, aliños, thyme and sazon goya, bring to a boil. Reduce the heat to medium-low. Let it simmer for 40 minutes. Add the potatoes, cilantro, salt and pepper, cover and cook for 25 minutes more or until the beef is cooked. 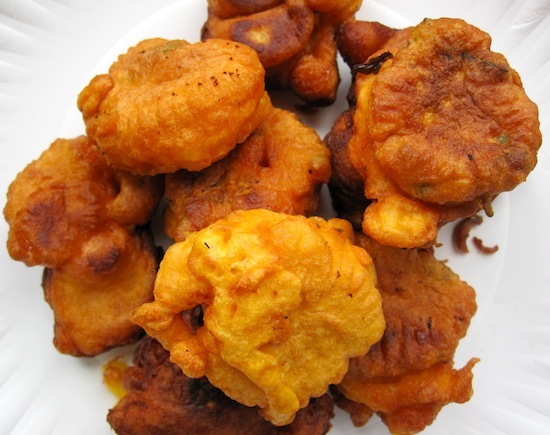 Meanwhile make the fritters: Heat oil to 325 degrees F.
In a medium bowl, combine flour, baking powder, cumin, paprika, salt, pepper and sazon goya. In a small bowl, combine milk and eggs. Add milk mixture to flour mixture, stirring well. Pour oil to a depth of 2 inches in a skillet. Drop by tablespoons into hot oil. Cook 2 to 4 minutes, or until golden, turning once. Drain on paper towels. Set aside. To serve: Ladle the soup in a bowl. Arrange the fritters in the center of the soup.Garnish with fresh cilantro. Love those fritters to soak up that goodness! Oh I Iove those fritters, Erica! The Columbian version of my mother’s dumplings! Such a lovely soup too…wouldn’t the rice be perfect with it! What a flavourful bowl of a variety of tastes and textures and produce! I love the fresh cilantro and the cold avocado with the steamy soup… and the fritters I dare say might be my favourite part. Certainly not an easy or fast dish – but still, a very straight forward and do able dish. I have it on my list “to make”. 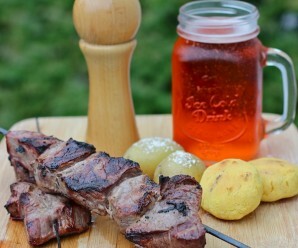 I love this recipe and the photos are beautiful. Thank you for sharing it. Erica…it’s snowing in New York and it is soooo cold, have a heart and mandame un platico”. Hope you are doing well and I know you are taking care with all these beautiful recipes you grace us with. Me voy a PR por 2 semanas…Un abrazo! I love the fritters, I want the fritters lol. The soup looks so appetizing. YUM! Oh I would love a big bowl of this soup right now!! I love it…it’s going so many levels of flavor and texture. I would so love to have a bowl with all the accompaniments. 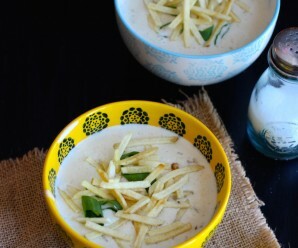 You always feature such amazing soups! I love everything about this one. So much going on in one bowl … yum! This soup sounds amazing, such bright excellent flavors and I just love the fritters in it, yum! Oh my, I want to jump right in there with the fritters, this soup looks so good!!!! oh my your food is so so good I want a bowl, hows the pregnancy going ? I love this soup and the ideas of the fritters! Oh my, you’ve done it to me again, this soup and the fritters look just amazing. I sense another batch of wonderful Columbian recipes itching to be made. 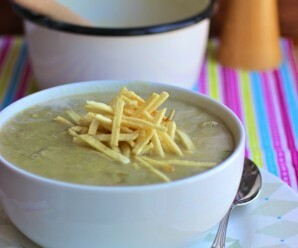 This is one of my favourite soups, the one my mom used to make on all the time. Now I made it for my children and they love it. Looks delicious! Some fried plantains or ripe bananas on the side would be a yummy additional side touch “a la colombiana”!! Feliz Año! !